Hope you all enjoyed your weekend. Here, it's getting quite cold so not so much to do on weekends. OK, now let's talk about the dresses that I'm going to show you today. I'm pretty sure, most of you already know www.promtimes.co.uk . But for those of you who haven't heard of it yet, let me tell you this is an online store that offers a variety of gorgeous Wedding dresses , Bridesmaid dresses , and Prom dresses at affordable price. Not only that, they have up to 75% OFF on all dresses so if you are thinking of getting some nice Cocktail/Prom or even Wedding dress , you should head over to their site. Meantime, let me show you some of my favorite dresses that you can find in this online store. This white cocktail/prom dress is one of my absolute favorites. 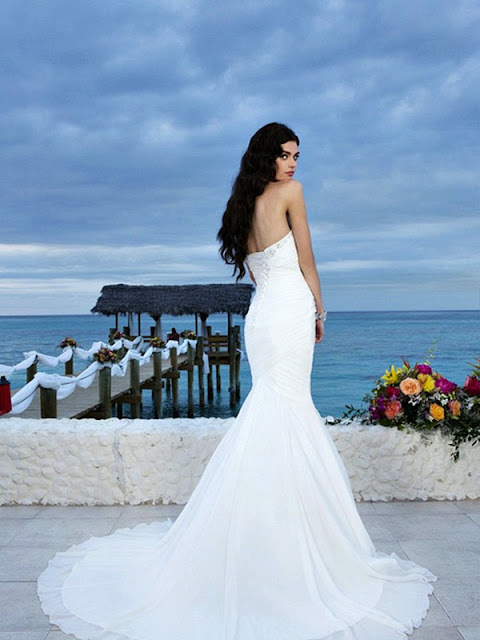 I love this Mermaid Sweetheart Chapel Train White Chiffon wedding dress, so elegant silhouette. And this Burgundy cocktail/prom dress below is not only gorgeous style but also amazing color for this fall. So, yes, if you don't want to spend too much but still, want to look fabulous , you should definitely check out this site. By the way, which dress is your favorite ? Let me know in the comments below and have a lovely day. Gorgeous dresses. Love the first one. So cute. Thanks for sharing this site with us. Their dresses look amazing! these are all super pretty! Not heard of them before, so affordable! Holy toledo that first dress! SO PRETTY! They seems to have a great selection of clothes too! The white cocktail dress is so pretty! Love the black lace accent! So many pretty dresses, especially the final red one shown - lovely embroidery over the torso! Stunnng selection of dresses Nina! Thanks for sharing! Gorgeous dresses, indeed! Thank you for sharing, I love them! I loved the first dress, in white and black, lovely! And then one in what people call now, blush :) with ruffles, is really so much my style, romantic and girlie! Lovely selection! I really loved the ruffled dress! Wow, I love the wine coloured one! this website has such beautiful dresses - I love models and prices. what fun dance dresses! very awesome! Promtimes have some amazing gowns and dresses. Great choices here, Nina. My goodness the dresses are so amazing! The wedding dress is divine. These dress are really fantastic!! These dresses are so pretty. I love the plum colored gown! All these dresses are awesome. The burgundy is my favorite! You looks great in this dress! Gorgeous! Who dresses so pretty !!!! Love love the white dress.. So elegant! Thanks Nina for sharing..I'm looking for dress to attend a wedding. Well wishes to you! Fabulous collection, I love the first and the second one the most, the rest are absolutely amazing too. Thank you for sharing!!! Very beautiful dress, and all of photos are amazing. Great dresses! Thanks for sharing! So many beautiful dresses! Nice selection. thanks for sharing! Hi there, beautiful dresses! I really love that nowadays there is a huge selection of sites whereto can't quality gowns!! Thanks for sharing. Such pretty dresses but I LOVE the black and white one (first). Sooooo pretty!!!! Gorgeous dresses, my favorite is the white cocktail dress as well love the design. The second dress oh my, it reminds me of a wedding dress it's gorgeous!